Ever downloaded a free game, only to discover you have to pay loads of money to actually play it? Ever get annoyed by an invite to play Candy Crush or Farmville? Ever wanted all of this to stop? Well, there is hope, since South Park magnificently addressed the issues. Here’s how they did it. Have you ever downloaded a free game to your cellphone, only to discover that in order to enjoy the game to its fullest, you have to dish out loads of cash? I myself might have fallen into that trap a few times, and apparently so did South Park’s creators Trey Parker and Matt Stone. Their newest episode of the show features an excellent analysis of the business models these games incorporate, on par with analyses by industry ‘professionals’ like John ‘Totalbiscuit’ Bain. So good even, that I think these ‘freemium’ games have been dealt a great blow with this newest episode. Because whereas Totalbiscuit only speaks to the core gamers, South Park reaches a much wider audience. In this blog post I will explain why by taking some quotes from the episode, but first, lets look at the nature of these freemium games and some notable examples. One of the first notable freemium games was the Facebook-game Farmville. At one point it seemed like everyone was playing that game. I myself never felt tempted to participate in the mania, even though my inbox was overflowing from invites to the game by ‘friends’. The more friends you had playing the game, the more content you got access to, i.e., the better your farm was compared to others’. This ‘invite-your-friends’-formula was later copied by King for their game ‘Candy Crush Saga’, which needed you to invite X number of friends to be able to access certain levels. You had to invite friends to progress, and of course your friends could see which level you were at in order for you to boast about your ‘progress’. Other notable examples of these ‘freemium’, or ‘pay to win’ (P2W) games include Clash of Clans, Tiny Hotel, and the notorious ‘Simpsons: Tapped Out’. Next to having to invite your friends to progress, these kind of games often feature excessive waiting times. Build a new house or crop, here, wait 24 hours to reap the results. Don’t like waiting? We have something to solve that. If you just pay us €0.49, you can skip the waiting time for your carrots to grow. If you’ve played any of these kind of games before, you are probably aware of how it works. Perhaps you’ve never paid to speed up your process, in which case, good for you! But lets now look at the episode in question, S18E06, “Freemium isn’t Free”. Haven’t seen it? You can watch it here (sort of) legally, as long as you put your proxy settings to ‘United States’. The episode starts out with Jimmy (you know, the one with crutches) telling Kyle about this new and wonderful free game based on the franchise they all love, Terrance & Phillip. For those who don’t know, it’s the two Canadian guys who made a living making literal fart-jokes. The tagline Jimmy uses, “if it’s free, why wouldn’t you [download it and give it a try]” is something heard very often when advertizing these kind of games. Strike one for South Park. Later in the episode, Jimmy is confronted by Kyle, Cartman and Kenny. It turns out he’s getting paid to advertize the game to his friends. “How do you get people addicted to crack? You give them the first grams for free”. Now the real fun begins, as the picture switches to ‘The Canadian Department of Mobile Gaming’, where the prince of Canada (previously featured in S15E03 ‘Royal Pudding’) together with a government official review their revenue. “Oh, it’s terrific! Two hundred thousand more American dollars in just a single day!”, the official exclaims. “Where is the roof on this thing?”, questions the prince. Meanwhile, Terrance and Phillip barge in, complaining about them using their likeness for a crappy mobile game without permission (perhaps another dig at EA and their Simpsons game). The official decides to spill the beans on their strategy. He begins to explain that in the past, gamers buy their games and enjoy them. With mobile games, they have the ability to make games that are “boring and stupid, but, if you pay for incentives, you’re rewarded”. And thus, ‘Freemium’ (“the ‘mium’ is Latin for ‘not really'”) is born. 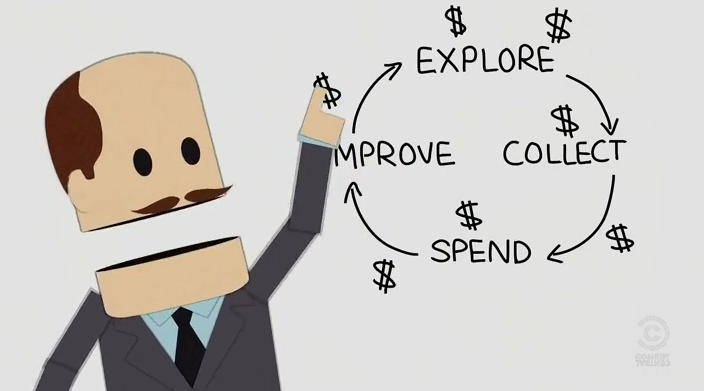 They picture a never-ending ‘RPG loop’, explore > collect > spend > improve > explore, etc., used by many RPG’s like Skyrim and The Witcher in which you spend experience points to improve your character, but substituted the experience points with money (pictured below). They explain that it is the thing that is “now”, and that it is just all a bunch of “harmless fun” – this is an often heard explanation from mobile game-developers while having to defend themselves from any criticism on their payment model. Simplicity: entice the player with a simple game loop. Compliments: use lots of flashing messages to compliment the player on his ‘progress’ to make players feel good about themselves. Fake currency: train the players to spend your fake currency. Switcharoo: offer the players a way to buy the fake currency with real money, so they forget they are spending real money. Waiting game: make the game about waiting, but make the player pay to not have to wait. Terrance and Phillip ask if the game can at least be fun, to which the government official explains that it can’t, because if the game is too fun there would be no reason for the player to spend money to make it more fun. Does this sound familiar to anyone yet? I think, even with this, Trey and Matt hit the nail on the head about what is wrong with these kind of games. But, if you don’t mind waiting, there’s no real profit to be made for these companies. Right? RIGHT?! Wrong. And this is where I refer back to Stan’s situation. You see, it is not you they’re after. 99% of the players who play these kind of games don’t even spend more than a dollar, euro or pound on it, if anything at all. The creators are looking for the ‘whales’. Stan is such a whale. In the episode, it is explained by Randy that Stan, like his grandfather, has a tendency to become addicted to things. These ‘game’-developers are after these kind of people, or the children who don’t understand the concept of money yet but play games on their father’s/mother’s phone/tablet, where a credit card is bundled to the account. Or just the really rich and lifeless who only want to dominate others in these kind of games. They are the cashcows, the people who get milked for their money. Terrance and Phillip later understand this concept, exclaiming the Canadians haven’t built a mobile game, but “an addiction machine”. The government official explains that in order to make a profit, he aims to get 200$ from the 1% of addicted players for a game that isn’t even worth 40 cents. Terrance complains: “but then all our money comes from people with problems!”. Yes, Terrance, that is exactly where the problem lies. I guess it is already strike 3 for South Park. Around 80% of all alcohol sales are from Alcoholics, and using that statistic bundled with slot machine mechanics, the official explains he is able to grab more money from an even smaller percentage of gamers. The alcohol industry “doesn’t care that 10% are going to become addicted, they are COUNTING on it”. This is where the analysis of freemium games ends, and the episode comes to its conclusion. I won’t spoil any of it, and it doesn’t add a lot to the topic of this post, so if you haven’t seen the episode yet and have gotten curious, here is the link to the episode again. Trey Parker and Matt Stone have done their homework, and have offered one of the best analysis of freemium games I have ever seen until this point. Other good examples are the aforementioned Totalbiscuit’s first look at the mobile Dungeon Keeper reboot. But why is this South Park episode so significant? The freemium or P2W model is becoming larger and larger, thanks to the success it had in the past. Both Apple’s iOS-store and the Google Play store are filled with uninspired freemium games whose only goal is to get as much cash as quickly as possible. So much so, that even accomplished ‘real’ game developers and publishers decide to create games based on this model. While they (namely EA) might use it to fund other, more financially risky games, developers like King (Candy Crush Saga), Zynga (Farmville) and Supercell (Clash of Clans) only use this money to improve their own lifestyles. For instance, the top five of people with highest income over 2013 in Finland, all worked for Supercell. I hope that this episode has brought the issue, that many core gamer has been complaining about now for years, under the eyes of the mainstream. Maybe now, something can finally be done to regulate these kind of practices before they ruin the gaming industry. Because inevitably, the freemium-market is going to overtake the normal, premium games market. And we’ll be left with games like ‘Godus’ which aren’t even worthy of the title ‘game’, but have actually managed to make their way onto the PC market. These games are not fun. They are designed to be addictive to only a few people, who would dish out a lot of cash for it. They take advantage of the weak, and should be heavily regulated. Maybe even a special tax on them, which could be used to treat addiction in people and to reduce profits from these games making them less advantageous to make for developers.